Storage containers are objects that allow the player to store items inside. Activating a storage container will open a window that displays its contents. Shift-clicking items will instantly transfer them to or from the container. Attempting to mine or pick up a storage container that still has items inside will cause the contents to spill out. 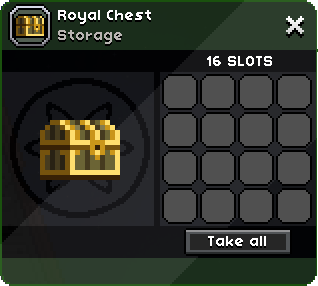 Most storage containers are limited to 9, 16, 24, or 32 slots, with the exceptions of the racial 48 slot storage lockers and the Shiplocker, which has 64 slots. Some can be crafted with materials at their corresponding Crafting Station, and others must be found randomly on Planets. Storage containers found on Planets are likely to adopt the theme of the surrounding location or Biome. A small number of special containers are refrigerated, meaning they preserve food and keep it from rotting. Be aware that storage containers at the Outpost and in Mission locations "reset" once there are no players in that location, deleting any new items left in those containers. This page was last modified on 28 July 2017, at 00:29.